The Injins, cowhands and the Amish settlers head out into unexplored country.Long on laughs, love and camaraderie. The planet Rock saga continues.This book is the best of the series, I can't wait for the next one. Action packed funny and thrilling. I love the relationship between Annie, Spud and Wolf. 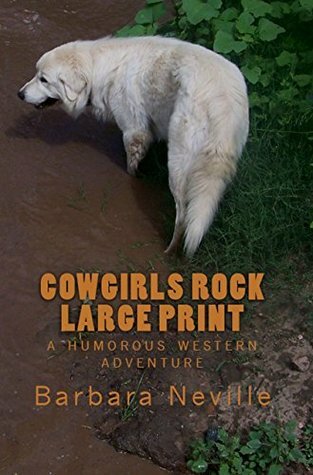 Barbara Neville - 2015 NaNoWriMo winner and prolific author; rustic western visionary Barbara Neville is an Arizona rancher and outdoorswoman, who writes what she knows. Her future worlds and historic past are set firmly in a longstanding tradition of caring for the land while living off of it. Cowhand, rancher, adventurer, prospector, artist and author of numerous books in the Spirit Animal series featuring Annie Many Horses. Neville writes of a speculative future, and the historic past, based on her real life experience. Her cats attend her writing sessions, preferring to lay on the keyboard. She ranches with goats, horses, guineas, peafowl, chickens, turkeys and Pyrenees livestock guardian dogs. Her dogs, goats and horses have fictional counterparts who appear in the pages of her books. She has led an unusual life of adventure, much of it off-grid.Barb is descended from a long line of adventurous folk. Cowboys, ranchers, prospectors, settlers, homesteaders and more. She carries on the long tradition of taking the road less traveled. Her fictional world draws heavily on her own life and the people, places and experiences of previous generations.Barb has been a rancher, horse trainer, cowhand, prospector, construction laborer, tree planter and a deckhand on Alaskan fishing boats. She has lived at various remote locations around the West. She grew up an Air Force brat, living in such exotic locations as Spain and Hawaii. Thus she learned Spanish and Hawaiian Pidgin. A one day round trip to the bottom of the Grand Canyon and back afoot, and many mountain ski touring and snowshoe and hiking backpack weeks pepper her history. Surfing and snorkeling were her hobbies in Hawaii. A wilderness adventurer in many climes, she raises goats, makes her own cheese & rides the world's greatest horses one of whom made the cover of 'On the Rocks'.